So as the day gets closer (3 weeks from tomorrow!) 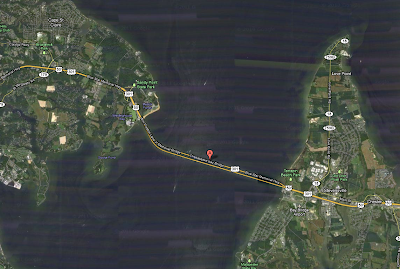 I am starting to gather more and more info about what to expect on June 12th when I dive into the Chesapeake Bay at Sandy Point State park and make my way along the bridges to the other side of the bay. I would do my own round up of the great sites out there, but Amy Reinink has already done it so well that I'm simply going to share her blog here: Chesapeake Bay Bridge Swim roundup but you should check out the whole blog because she's a wonderful writer and also a great runner! I've booked the hotel (MAN is it cheap to stay in hotels outside of NYC! ), put in several miles in the water and I am getting REALLY EXCITED! I have a few more weeks of serious training before I'm really ready, but I feel like I am READY to take on those bridges. Check out the pictures here: Rob Aquatics Race Report 2010 to get a glimpse of what I'll be looking at during the 4.4 mile journey. I'm awed by those bridges. Wow. It's funny how when you mostly socialize with runners, mentioning a long swim gets a "woah" in the same way that running 20 miles gets a "woahh" from a non-runner. Since I'm in both of those circles, swimming and running, I'm jaded when it comes to the distances of either. When I try to explain that swimming 5000 yds is "like running 13 miles" I still get baffled looks from my running friends. It might be the time equivalent, but it encourages a lot of questions. How do you keep count of your laps? (in the pool) - I just do. I count in sets when doing specific workouts like 10x150yds (that's 10x6 lengths). You learn at a young age as a swimmer to keep track of things like that. When we do our warmup of 1650,I count every length and try my best to keep track. It helps to have my stopwatch running and hit the lap button every 500yds because I know it takes around 8mins to swim that. If it sounds like torture to count that much, it's not. It's second nature after all these years. Also, just because I'm counting doesn't mean that I'm not also thinking about other things. "What Do you think about?" is a very popular question and the answer is simple: everything or nothing. It's no different from what I think about on a run, which means I mostly think about what I'm going to eat when I finish. :) You'd probably be surprised how much you can learn about people between sets. I have a bunch of pool friends that I've gotten to know simply from swimming in front of or behind them and chatting after each 200 or 1650 or whatever the distance may be. All in all my swim training has been really fun and I'm racking up the yards this month. In the first week of May I swam almost 13,000 yards, just over 10,000 yards last week and I'm hoping to hit around 16,000 for this week by Sunday. 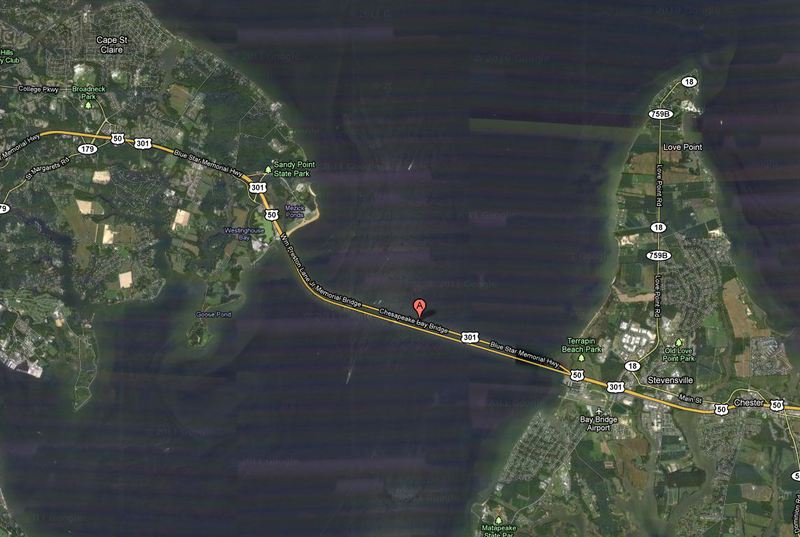 Yes, that is a lot of yards, but I'll be ready for the Chesapeake Bay swim come June 12th! After an exhausting day at Bear Mountain on Saturday, I was zonked when I woke up on Sunday too. (I Realize this doesn't bode well for my plans to possibly run the half marathon next year). I lounged around trying to get my mojo back and trying to get myself together to go for a swim. I had lots of little projects around the apartment, one of which required a trip to the hardware store. The minute I stepped outside, I knew that I HAD to get out for a run. I missed my usual Saturday morning run because of Bear Mountain, and I would have missed my Sunday swim if I'd gone to NJ... There seemed to be only one thing to do: run and swim. After some deliberation over how to organize my day, I finally decided to run to the pool (at first I dismissed this as crazy) and then swim. The plan was to take a very tiny bag with me so I could put on clean clothes after my swim and shower. It worked out perfectly once I worked out the details. I was hoping for a somewhat speedy run down the west side Greenway because it is downhill from home and then flat as can be. I took off at a warmup pace around 8:00 and proceeded to pick up the pace to sub 7:30's for the remaining miles. I had to work at it a bit along the busier parts of the Greenway on the UWS, but it almost felt effortless. I racked up 7.5 miles in 56:00 or so and was really happy with the effort. I then rinsed off and hopped into the pool for a mile at a moderate pace. I decided this was good training for my swim to swim at mile while "tired". I didn't feel tired though, I felt great. I swam a total of 2000 yds before grabbing a giant coconut water and heading home. I felt awesome and was floating on endorphins until I got home and crashed. I was happy to have worked that hard and pushed myself instead of lounging on the couch all day. Ahh, tri season is approaching quickly. It's Tuesday now and I still have some lingering soreness in my adductors and quads, but most of the soreness worked itself out in the pool Monday afternoon. I'm putting in the miles and getting tips here and there regarding the Great Bay swim coming up in 5 weeks. My training has been steady and I'm feeling good about a possible finish in under 2 hours. I'll have a better idea after some open water practice at the end of the month. The North Face Endurance Challenge at Bear Mountain, NY kicked off my weekend nice and early Saturday morning. A 4:45 alarm woke me from a restless sleep and after flashbacks to Crew practice in college, I rolled out of bed and into some comfy clothes. Elyssa was snoozing on my couch so I flicked on the coffee maker and woke her up too. We slowly came to life as we drove down to Harlem to pick up fellow volunteer, Tracy and headed north on the Palisades Pkwy. The sunrise was beautiful as we rolled down into the Festival area at 6:30am, knowing that the runners started at 5am and we're already well into the race. I signed up to man the same aid Station as I did last yr, Camp Lanowa which sits at mile 27.7 in the middle of what is probably a bustling summer camp in the summer months. As the crew got things set up, a course sweeper arrived and told me about the vandalism he encountered while running the course earlier. Unbelievable, someone had gone out of their way to remove course markings from a 6 mile stretch of the trail in the middle of the night. Again! It happens every year, and I am blown away every time I hear about it. The sweeper had started running at 2:30 and spent hours running and re-marking the course. After he helped out all day, we broke down the aid station and he then ran the rest of the course and took down the markers! Wow. On top of his athletic abilities, he's also just a really, really nice guy. If I were organizing a race, I'd definitely want Russell on my team. Honestly though, the entire North Face team, headed up by Nick Moore, is like the Dream Team of race organizers. It is such a well run event, and I hope to at least run the half marathon on Sunday one year after volunteering at the 50 miler on Saturday. The day went very smoothly at our station with the exception of terrible radio communication with the race directors, something we had to remedy by texting and calling for most of the day. We were lucky enough to have some pacers at our station who were all really great and helped us out tremendously until their runners arrived. One of them was pacing one of the lead men, so we lost him early but not without getting the scoop on what it's like at the front of the pack. The leaders were very spread out this year, and the lead runner was minutes ahead of the next guy, but by the finish #2 guy was almost 15 minutes ahead of previous #1 guy. That kind of uncertainty doesn't happen in road marathons. I had to keep track of each of the runners (all 195 that started) ﻿ and was able to tell the leaders how far behind they were. Just like last year, families and crews gathered at our aid station, making it a busy and fun place to be. I recognized Nikki Kimball's crew (one older man in a wool sweater) from last year as he lined up her bottles of water, coke and other mysterious concoctions. Nikki wasn't in the lead this year though, Annette???? came through before her and ended up winning the women's race. I was happy to see that there were 4 women in the top 20 finishers. The trails are the ultimate levelers of the playing field. Plenty of bloody, beat up runners came through during the course of the morning, most of whom were having a good time despite the crazy hills, rocks and technical trails. A few dropped out at our station after an injury or just plain undertraining knocked them down too many times. I was impressed by everyone who made it that far! 28 miles on a very difficult course is worth being proud of. I hope they're able to walk normally soon. Thanks to everyone who made the day a success, I love this event and I'm grateful for my friends who came along at the crack of dawn for this adventure. Congrats to all of the finishers as well, wow that's an awesome accomplishment. You ought to think about joining me next year!